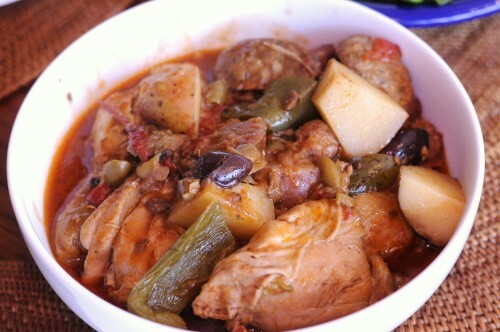 Some days I just decide to make a “refrigerator stew,” which only means I’ll dump all the leftover stragglers in the fridge into a pot and cook them on low heat, and with consistently good results. I had some chicken and andouille sausage in the freezer, and a handful of uneaten olives from a party. With my handy tube of tomato paste, I was all set. 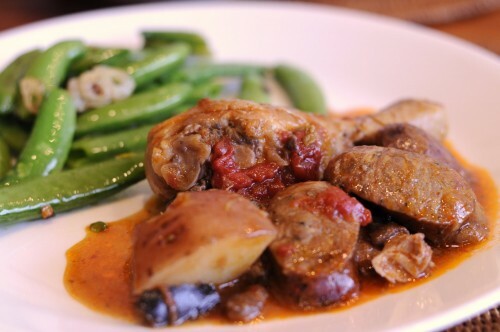 Chicken and andouille sausage stew, side of garlic snap peas. 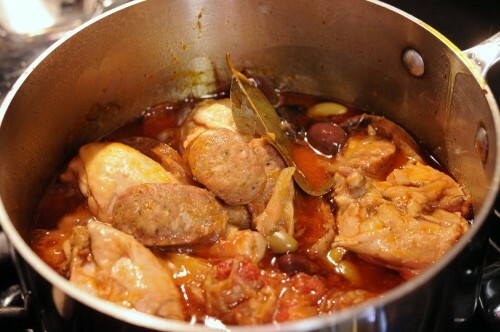 The result was a rich and smoky stew, owing to the sausage which always gives anything a nice, cured and savory taste. 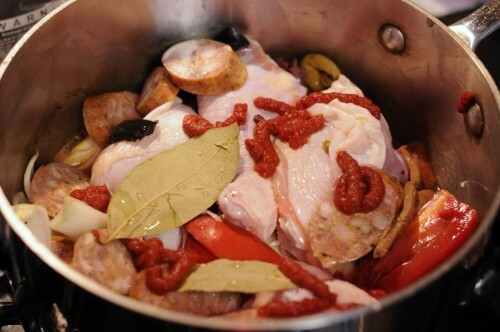 You may also try this with italian sausage or chorizo with similar results. We begin by dumping everything in a pot: chicken, sausage, tomato, tomato paste, bay leaves, onion, bell pepper, and 1/2 cup of water. Simmer covered onvery low heat for about an hour and a half, stirring occasionally. Add the potato, and depending on your desired consistency, cook for another thirty minutes uncovered to thicken sauce, or covered to maintain the liquid in the sauce. Chicken and andouille sausage stew, garlic snap peas. Mangia! Put everything except the potato into a stew pot and simmer covered on low heat for 90 minutes, stirring occasionally. Add potato and simmer for thirty more minutes. Serve with rice or bread, and a side of vegetables. Mangia! 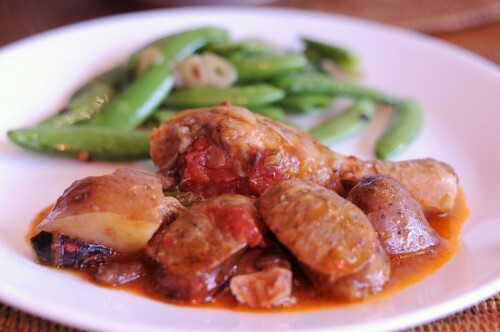 This entry was posted in cooking, Recipes and tagged andouille, chicken, sausage on April 25, 2012 by admin.